Originally used by the Canadian Air Force, as a service hostel/leave club, these buildings were taken over for use by the York Education Committee. For many years they were known as the Marygate Centre, a base for adult education. 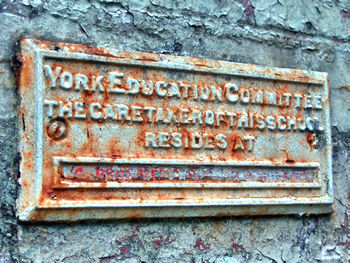 The York City Council minutes show that the buildings were adapted for educational use soon after the war, first used for the ’emergency training’ of teachers. The Ministry of Education wanted to acquire the ‘Canadian YMCA Hostel’ in 1946, though the Canadian YMCA apparently also had plans for the future of the buildings. By June 1946 it had been agreed that the former hostel buildings were to be used in connection with the emergency training of teachers: ‘so that the necessary teachers will be available in the country for the raising of the school leaving age’. ‘a) Additional accommodation for the School of Art. b) Accommodation for the Day Continuation School for Girls. c) Provision of a basic Catering Course. d) Daytime classes for women in Housecraft and allied activities. October 1948 saw approval of the use of the buildings as outlined, and noted that ‘one of the present dormitories’ should ‘be adapted as supplementary accommodation for the School of Arts and Crafts‘ (aka York School of Art). The buildings are also to be used ‘for day classes for women and girls in Homecraft and related subjects’. In January 1949 there’s a suggestion that Miss P M Everitt – Head of the Day Continuation School for Girls – should be offered ‘the residential accommodation in the Tutor’s flat in the Hostel’. Things got lively in the 1950s, with a proposal in June 1952 to ‘run a class in Folk Dancing (American Square)’. So I’ll leave you with that cheerful scene of dancing classes, 10 years after the ‘Baedeker raid‘ of 1942. Except to say that Elizabeth, who emailed me, remembers dressmaking classes here in the 1970s, and having to queue for them, as they were so popular. Interesting, isn’t it, that these buildings were originally constructed to shelter men who were trained to kill, to fly heavy bombers overseas to enemy targets, men who were in the thick of it during the conflict of the Second World War – and that by the late 1940s, through to the 1970s, they were to be occupied mainly by women and girls learning ‘Housecraft and allied activities’ – ‘activities’ fundamentally peaceful and domestic. Quite a contrast. The was demolished in 2011-12.